The Nelson Family Smorgasbord: Thank You Babo!! ..alright, for those of you who now think I'm just fishing for compliments because my Blog border looks so dang stinking cute! !...think again! I am not at all the one to be given the credit for "renovating" my page. My wonderful sister, Heather (Babo) snuck into our account and surprised me with THIS! Thank You Babo! Maybe this "Blog Business" won't be so bad after all! Love you! Oh, Heather's so sweet! 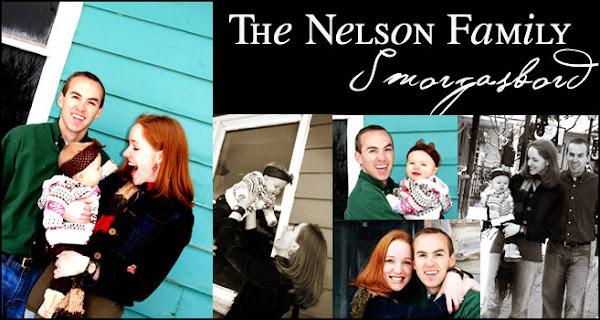 Your blog is darling and I can't wait to get wonderfully fun updates on the Nelson clan and sweet pictures of Charly. How fun! You are so very welcome, Sis! Do you like the "Smorgasbord" font or is it too hard to read? LMK! And WOW....two blog entries in ONE DAY! You are on a roll! LOL! LOVE YOU!!!! Have a happy one! Welcome aboard! I'm excited to see pictures and updates. It is so fun to keep up with everyone and see what everyone is doing! Blog on baby!